Jakub Vagner clearly remembers the first fish he caught. a�?I was five. I had gone fishing with my family in a small village behind Prague (his hometown). And, I caught a carp. It was 10 kg, almost as big as I was that time. Both my father andA�grandfather told me that moment, a�?If this is your first fish, then your life would be all about big fishesa��.a�? 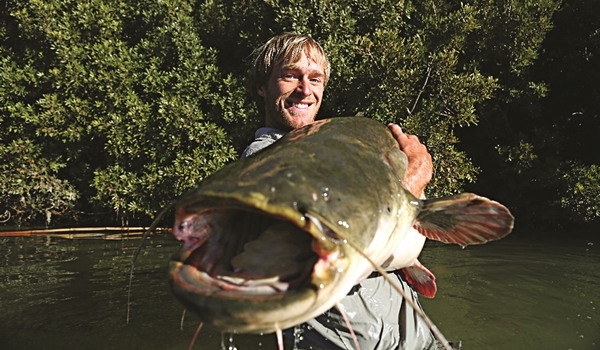 Today, at 33, Vagner is known world over as a master angler a�� who has caught rare and unseen freshwater fishes that grow bigger than average men and weigh over 200 kg. You can watch some of his extreme exploits amidst the inaccessible waters of Congo, Mongolia, Canada, Thailand, Ecuador and Peru, on Animal Planeta��s ongoing show, Big Fish Man. His pet project to map 27 rare freshwater fishes is also underway. So, whata��s the master bait? Vagner, the only non-musician in his family, says, a�?It doesna��t exist. Every fish behaves differently. All you can do is sit on the bank of rivers for hours.a�? Vagner had to once wait for nine months in and out of the Congo river to lap the mighty Goliath tiger fish, with its 32 shark-like teeth. But celebrations are usually short-lived as he releases the fishes back in waters. a�?These fishes are one of the last living dinosaurs on our planet. If you kill a 50-70-year-old fish, your grand kids will have to wait for a lifetime to see them again. I am trying to show that we dona��t just have big animals on land, inside oceans but also in rivers. But our knowledge of them is very limited,a�? he explains. Understandably, Vagner doesna��t devour in a fish meal. a�?Aah, fishes that I catch are too big to cook (laughs).a�?